I’m finally taking my post-bar trip – a week-long vacation in Louisiana. I’m so excited to be here. I haven’t been back since I was 6, which makes it 22 long years. It’s strange because I’m from here, but there’s so little that I really remember. I only have fragments of memories of places and events. It’s great to be able to finally place those memories. Of course, it’d be a little bit better if I wasn’t placing those memories during a tropical storm, but you take what you can get! My mom (who I dragged with me on the trip so she could show me the sights!) and I arrived yesterday afternoon. 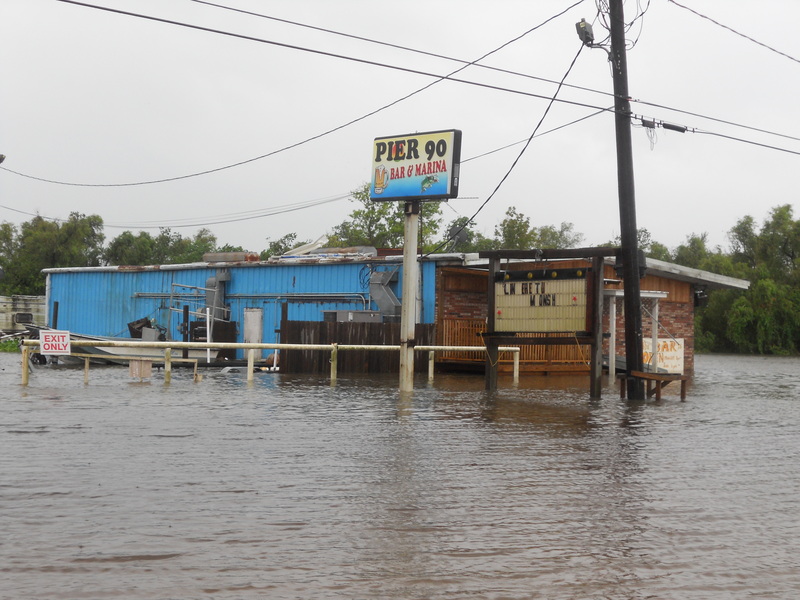 We were a bit concerned that we might have trouble getting here because of the weather, but we were absolutely fine. In fact, we actually arrived a little early! 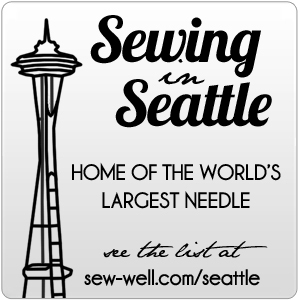 We grabbed our luggage, picked up our rental car and headed into the City. 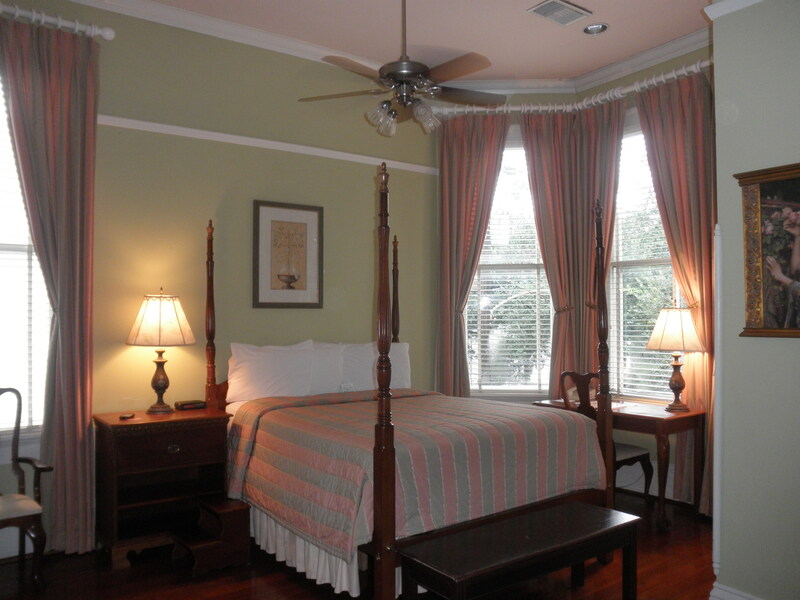 We are staying at the Queen Anne Hotel in New Orleans, which is really great. The hotel room, which even has a fridge and a microwave! 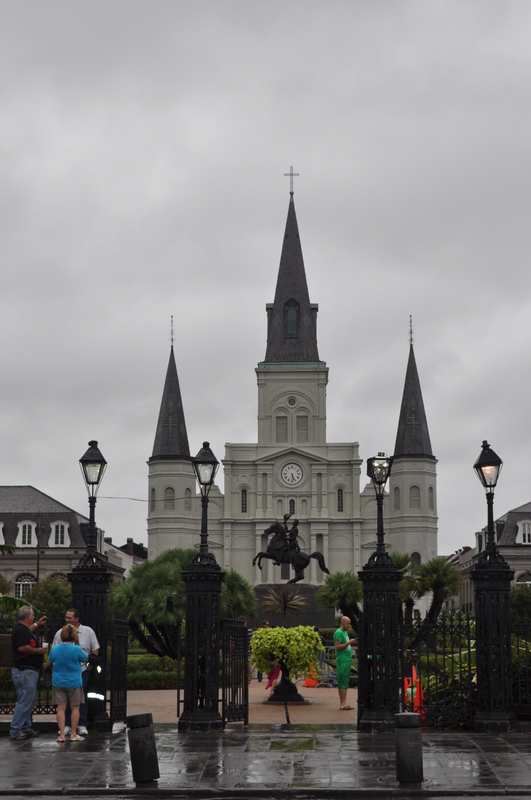 After settling into our hotel, we headed out to the French Quarter. St. Louis Cathedral in the French Quarter. We ended up eating dinner at the Gumbo Pot (which was awful, by the way), and then walked around (despite the crazy winds and rain!). Our final stop that evening was for dessert at Café du Monde. 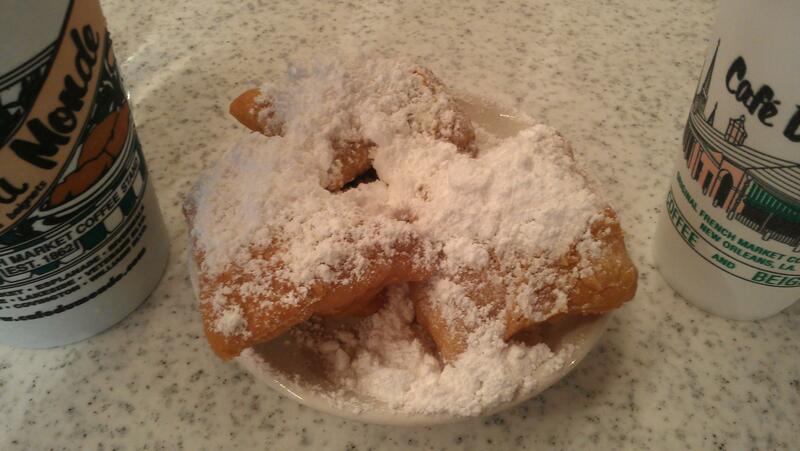 The beignets were just as delicious as I remember them! (Of course, the taste of beignets remains within my memory fragments… 🙂 ) Then, we returned to the hotel to get warm and watch LSU trounce the Oregon Ducks. Go Tigers! Today, we headed south. 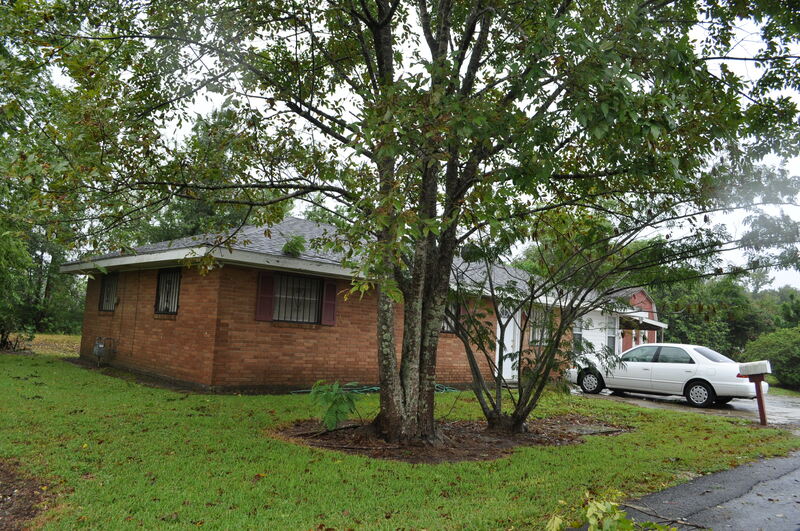 We drove down to Houma, which is my hometown and found the first house I ever lived in. I have no memories of that place, but it was cool to see. 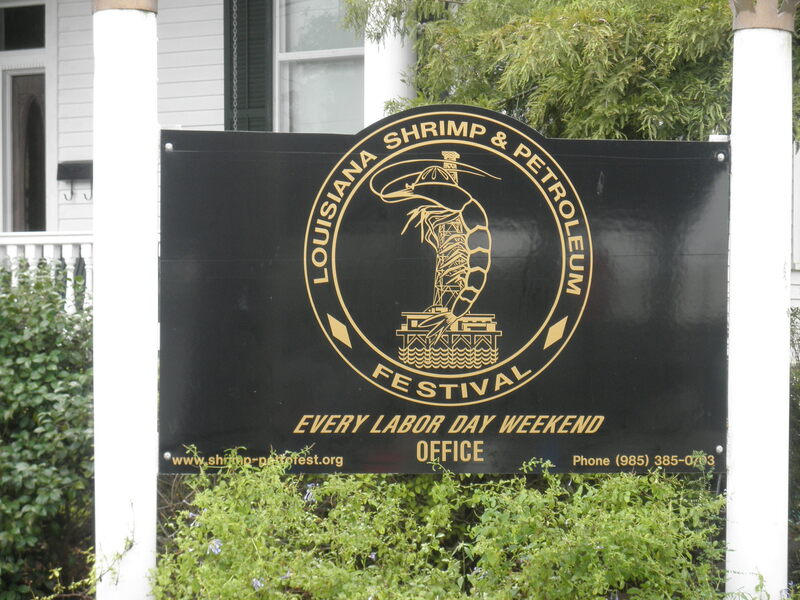 Then, we headed farther south to Morgan City to go to the Shrimp and Petroleum Festival, which has happened every Labor Day weekend for the last 75 years! We had a blast, and ate tons of tasty foods! 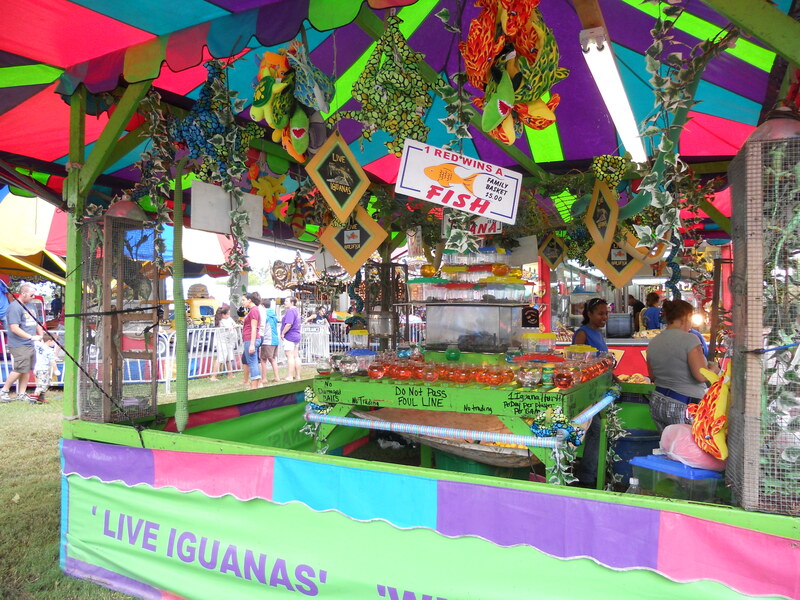 Check out all the foods offered! How to choose?? 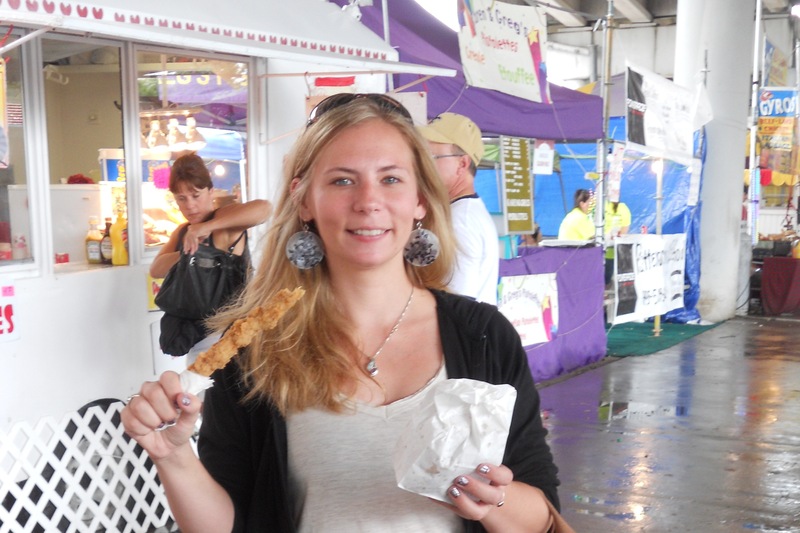 I started with the alligator on a stick and cracklin' (fried pork rinds). Yum! We ate so much good food! 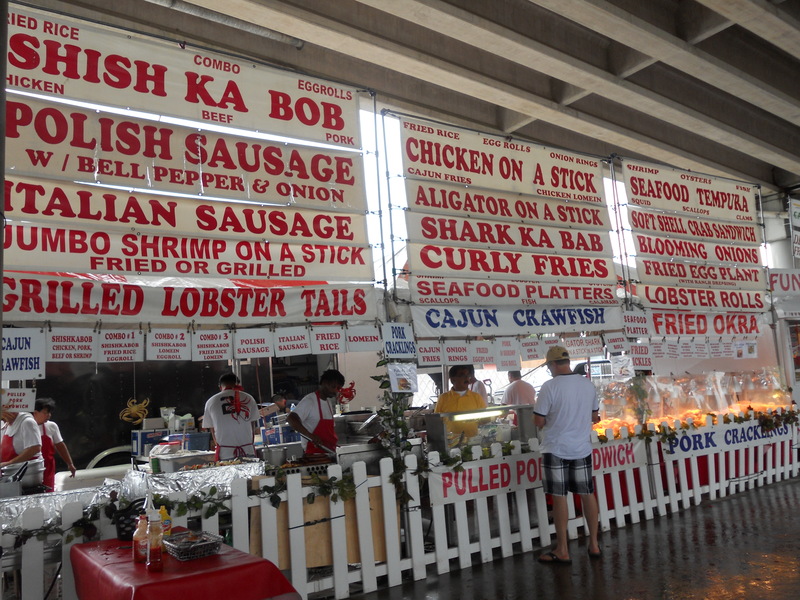 We enjoyed fried alligator, cracklins, crawfish bread, and boudin balls. Mmmm. And bizarrely enough, we sat down at a picnic table across from a couple who knows my family! The guy used to work for my father’s cousin and knows the family really well. Only in Louisiana would this happen! I love the small towns. On our way back up to New Orleans, we swung by Thibadeaux to see my mom’s alma matter, Nicholl’s State University. 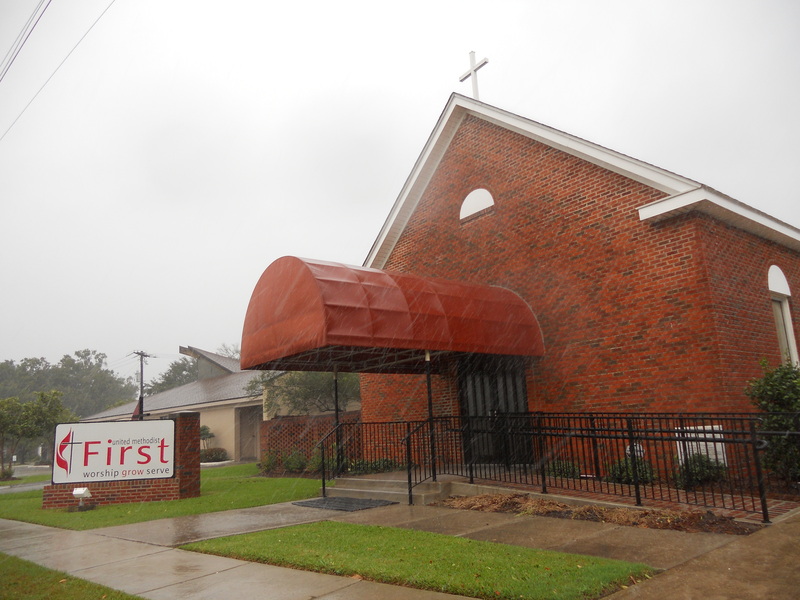 And we ended up driving right past the church where my parents got married. Where my parents got married. The storm was raging the whole time and we experienced a ton of rain and wind. I think we missed most of it, though, and it should be all cleared out within the next 24 hours or so. The damage caused by it was pretty evident, though. 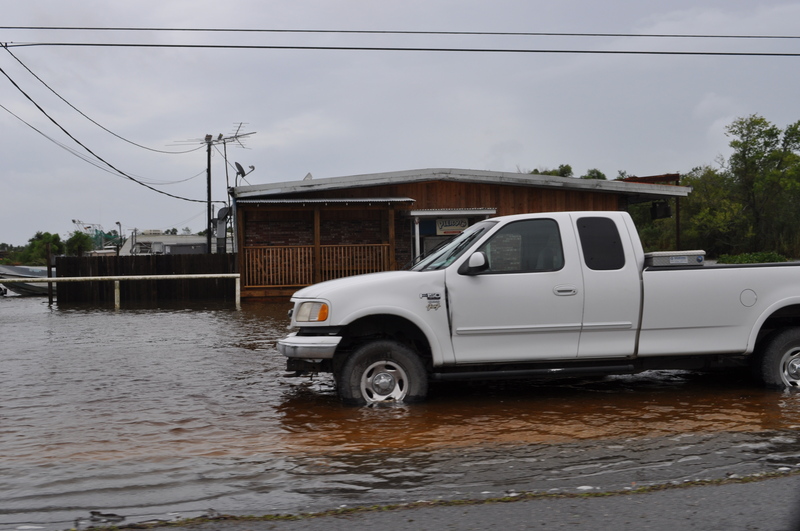 Flooding from Tropical Storm Lee. While this appears to be a building in a lake, it really is just a building on the street with a large parking lot. Couldn’t tell that now, though! Clearly, Tropical Storm Lee has left it’s mark. But, the residents will get past it, as they also always do. Heck, many of them attended a fair in the middle of it! Got to love the resilience!